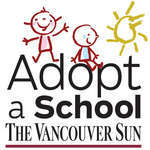 At Lord Selkirk Elementary School in Vancouver, there is growing number of students and families who simply do not have enough food, whether the students are at home or at school. Funding for a Weekend Food Program -- in the amount of $1,750 -- can help to eliminate some of the hunger that students and families are facing. Weekend food packages will be organized each week for students to pick up. Healthy food choices will be a priority, and cultural preferences will be met. Larger food packages will be sent home to offset some of the food costs that come with having children home over the winter and spring breaks.